Well, yesterday was 80 degrees here in Nashville, so I’ve already started my mood board for summer! 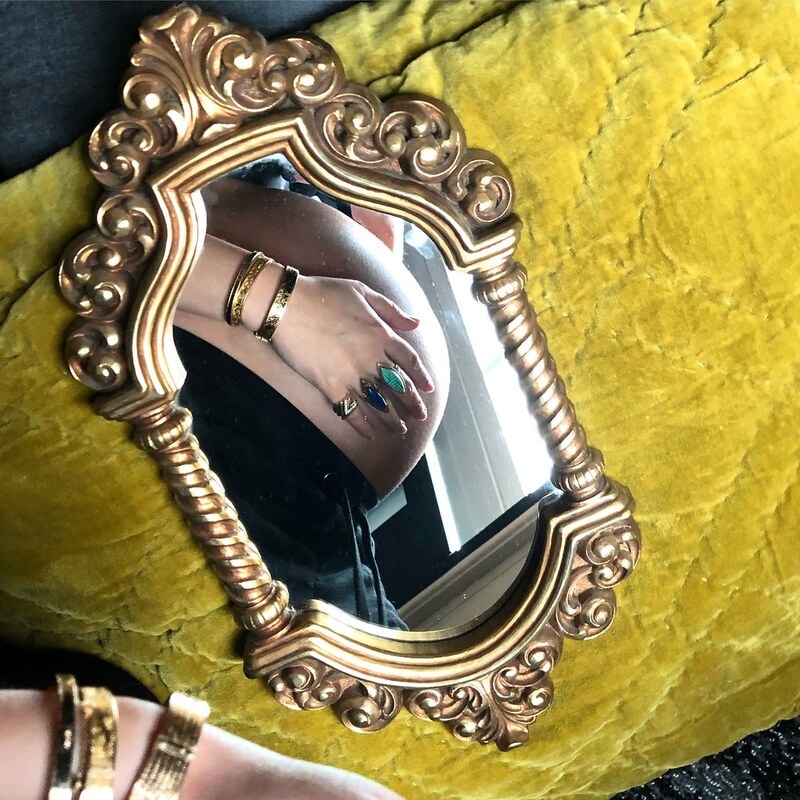 I’m excited for more juicy gems, eBay finds, jewelry auction hunting, the arrival of baby, getting back to antiquing and treasure hunting, and so much more. I love putting my ideas and inspirations into these Obsession posts and hope you like them too. I’m doing my top 13 this time because I’m trying to get over my hatred for that number lol. 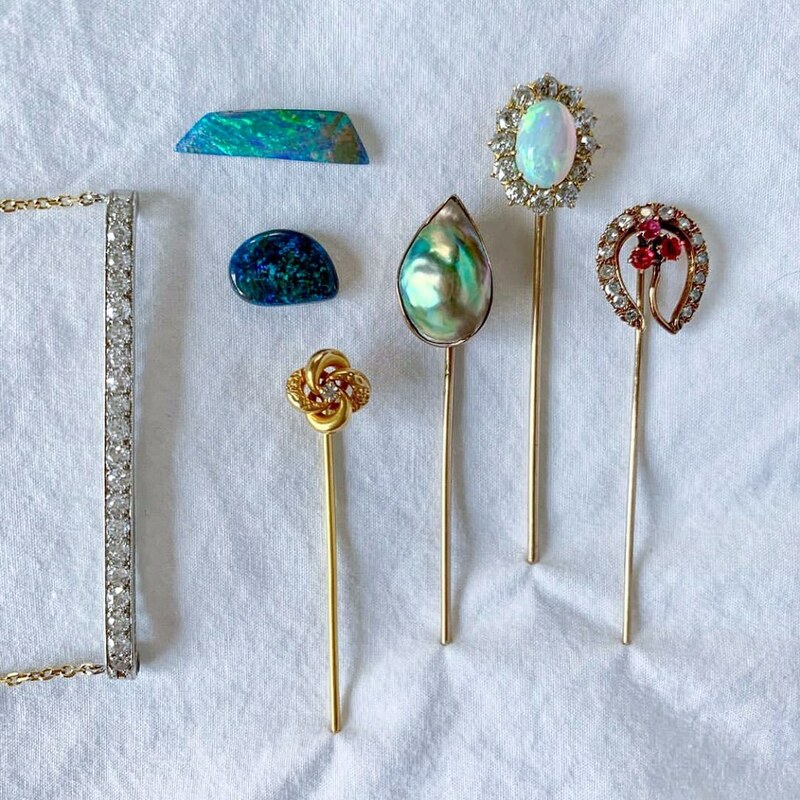 1 — Of course for summer, I’m looking to add some new earrings to my jewelry wardrobe. With hot temperatures, everyone will be wearing their hair up more which is a perfect opportunity to show off some cool ear stacks. 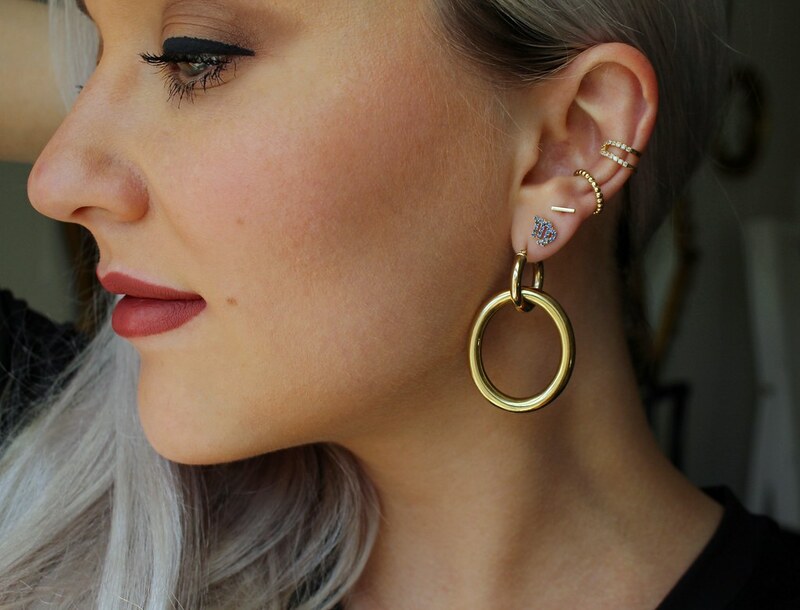 As you know, I’m a huge fan of ear cuffs and this is my newest addition! 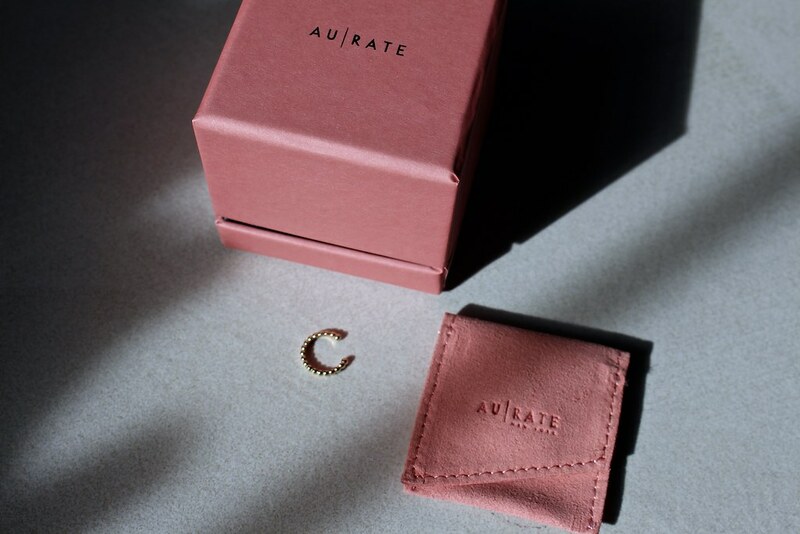 It is the Mini Circle Ear Cuff from AU-Rate, a company I’ve heard many good things about. This piece was only $150 and is 14k solid yellow gold. You can also get it in 18k gold if you’d like, and choose between yellow, rose or white gold. 2 — Speaking of, here’s what the AU-Rate ear cuff looks like when worn! It goes perfectly with my Paige Novick diamond ear cuff that I wear ALL the time. If you watch my Instagram Stories, you might have seen that I mentioned buying a pair of earrings that were not in my jewelry budget at the moment (so I sold a few pairs from my collection that I haven’t worn in awhile). These crazy cool double hoops were what I was talking about! I love how hard hoops are coming back and these are seriously ultra-cool. They make any outfit way more on-trend, even if it is far from looking trendy. 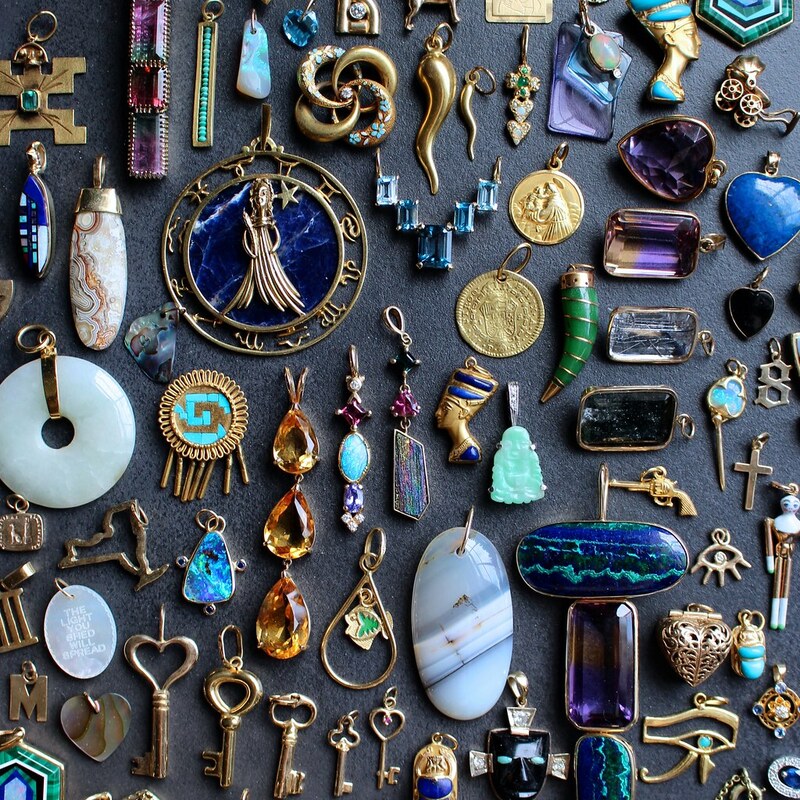 5 — I am looking forward to continuing to work on expanding my charm collection this summer. Last summer I bought several gold keys and big gemmy charms. This year I hope to add to my Motherhood charm necklace I plan on creating. Do you have any special collecting goals for the summer? 6 — The best decision I ever made was putting these cut crystal diamond paperweights in my window of my office. Now, everyday around 3:30pm-5pm I see rainbows unfold as the sun shifts. It is definitely a time of day where I get a lot of work done and I really enjoy being in my office. Lately, I’ve traded in coffee shops for my couch as my workspace because my belly is getting so big! Buying a TV Tray off Amazon was another smart move. 7 — I’m still so obsessed with the LoriAnn Jewelry collaboration ring I helped design. 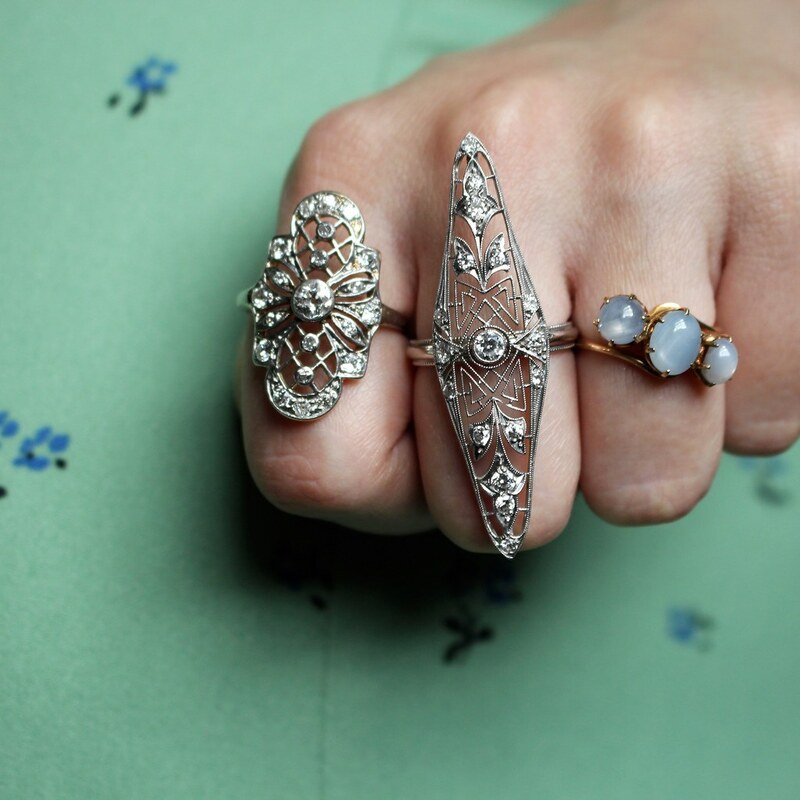 This photo shows the inspiration ring behind the piece and you can see what we’ve added to make it our own. 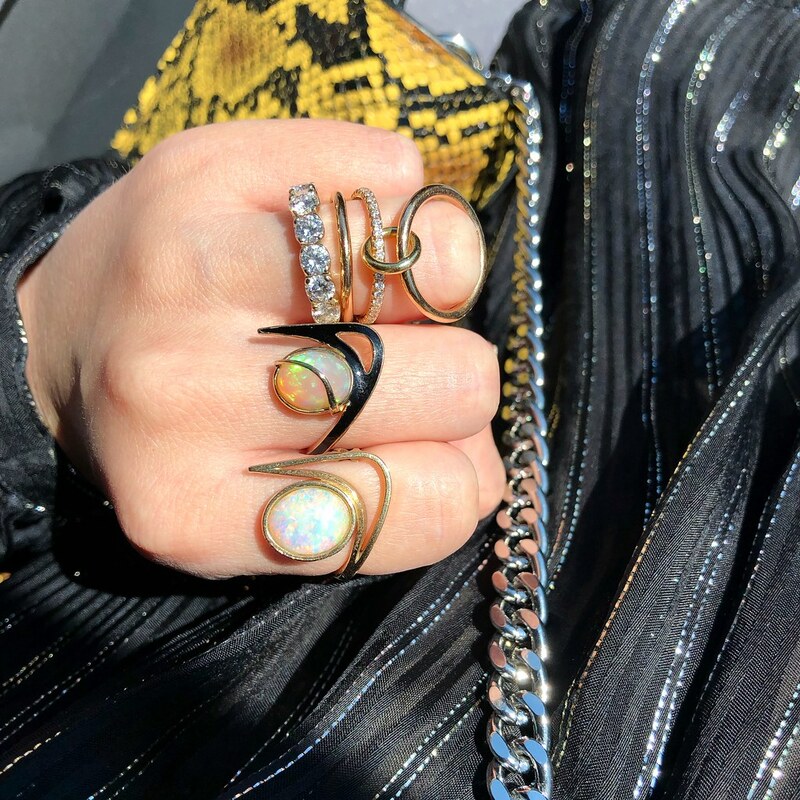 The black enamel makes the ring POP and the Ethiopian opal just GLOWS. You can also order this ring without the enamel if you prefer. I’m still taking orders, so you can email sales@gemgossip.com to place yours today! 8 — We are halfway through diamond month! April’s birthstone is diamond and all you lucky April babies get to have this gorgeous gemstone as your birthstone. 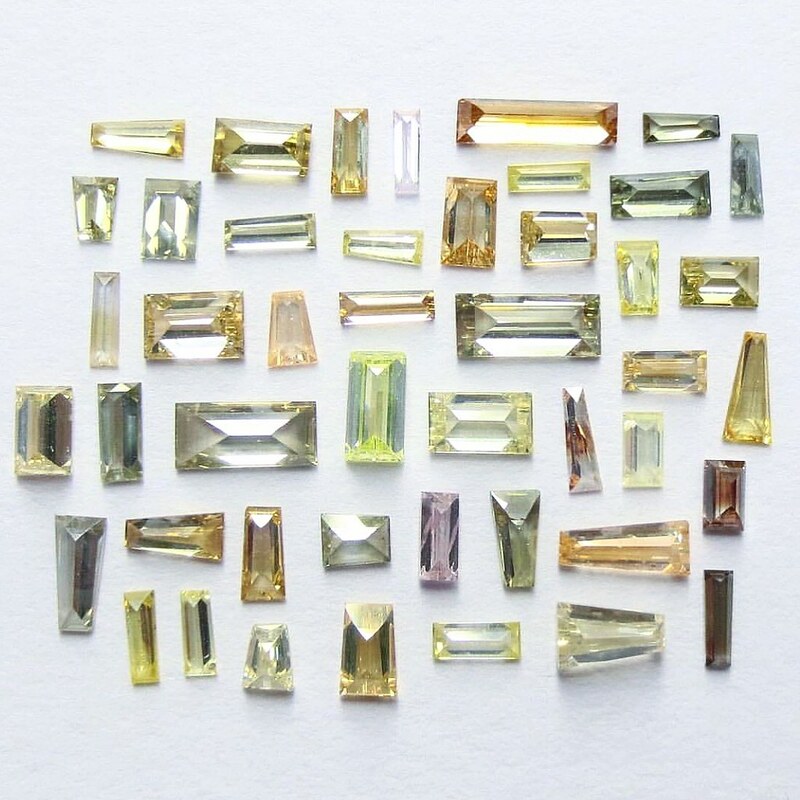 I love this collage of baguette cut diamonds of various colors laid table-down from Rough Diamond World. Even if April is not your birth month, you can still enjoy this gem — but I like to celebrate it even more during this time! 9 — I’m now onto the home stretch of my pregnancy and have been told he is “running out of room” so that combined with my mom being early with all her deliveries leads me to sitting at home, waiting for it to happen! I’ve been trying to keep busy, although a list of things to get done is tough for someone to do that can barely walk more than a couple blocks. Hanging in there and enjoying these last few moments! Oh, and my push present is here and I may or may not have worn it a few times already. 10 — One of my favorite things to do is package up the items you all are buying on my shop page! 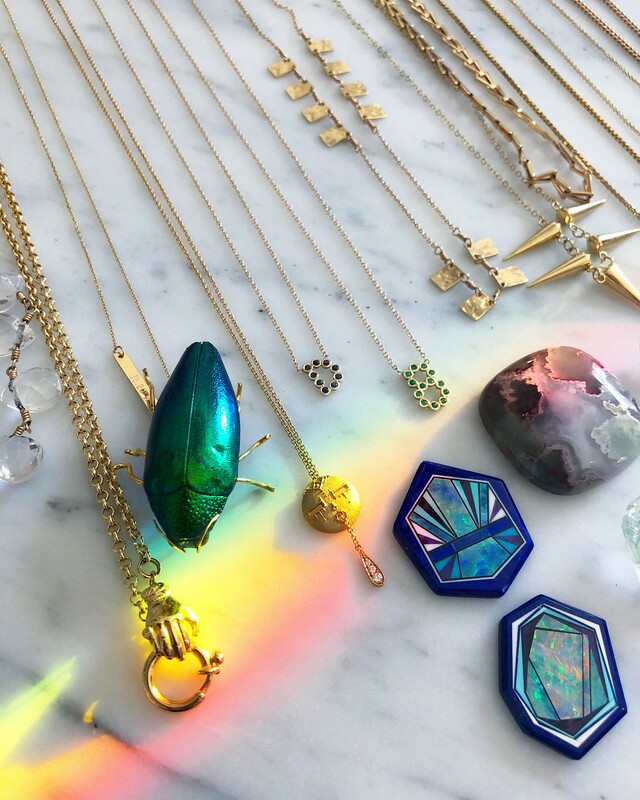 I’ve loved having shopGemGossip these past couple of years and will continue to bring new and exciting pieces. 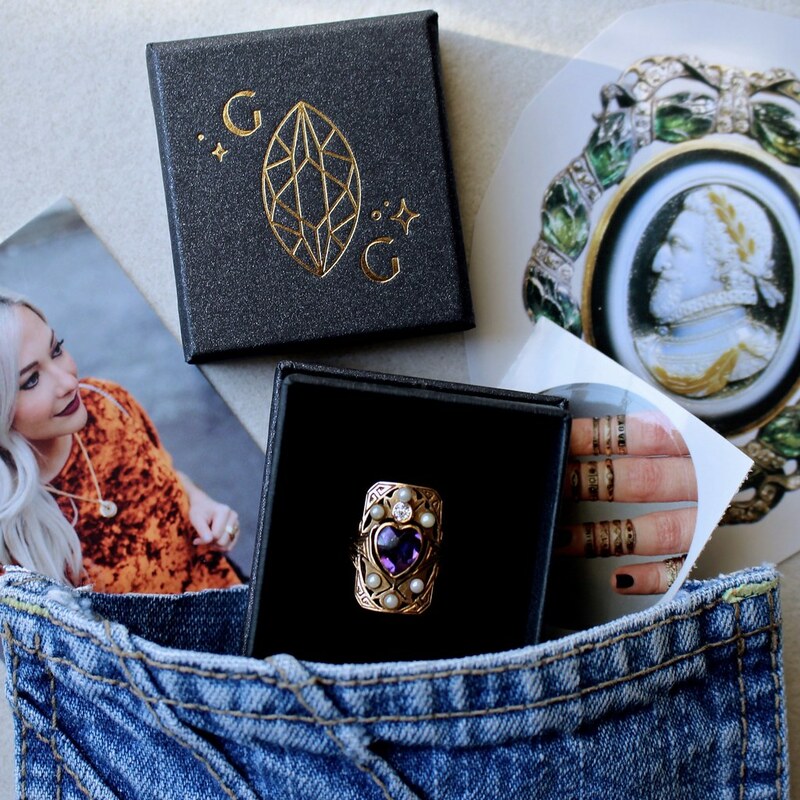 Every purchase is packaged up by myself and comes with a business card, stickers, and cutout from an antique jewelry book…all placed in a pants pocket. All of April, I’m including a special gift as well! 11 — I will admit that I don’t watch Game of Thrones, but the excitement for the new season that debuts this Sunday is sort of contagious. My husband is a huge fan and I’ve lost him to the TV these past few weeks as he has been rewatching the past seasons. I was inspired to create a Game of Thrones ring stack and asked others to do the same. I’ve enjoyed seeing your posts and have shared some favorites in my Stories. 12 — Earlier this month Liz Kantner visited Nashville and it was awesome to have her stop by and have lunch. These pins were a gift from her and her partner who have been busy opening up their first tattoo shop in Asheville, NC. 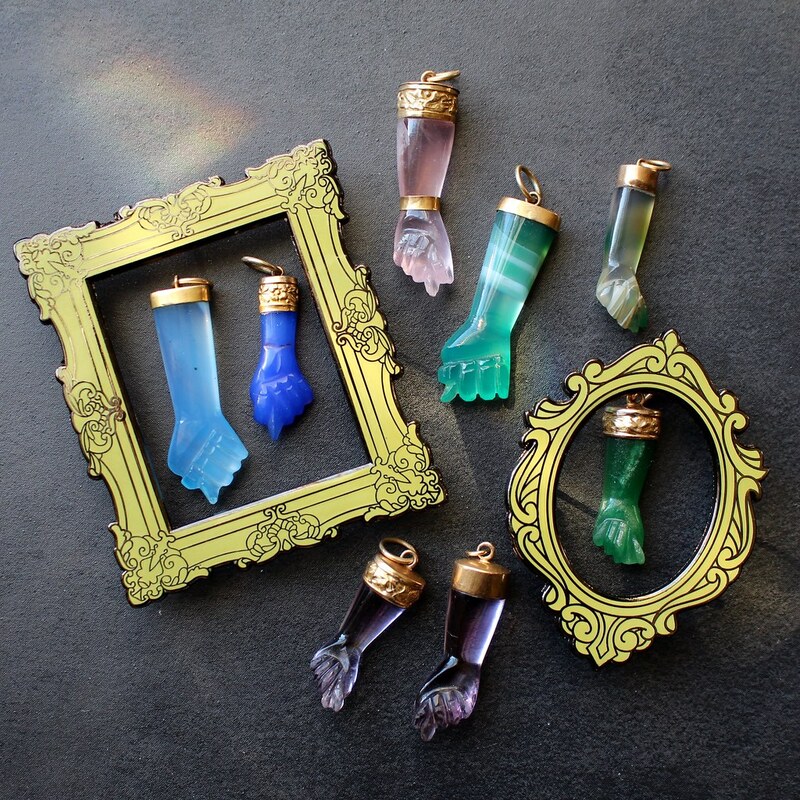 The shop is quite dreamy and has a jewelry section that is neatly curated by Liz herself. The shop is called Divination Tattoo and I highly recommend it if you’re ever visiting the very up-and-coming Asheville (where I also recommend visiting the Biltmore Mansion). 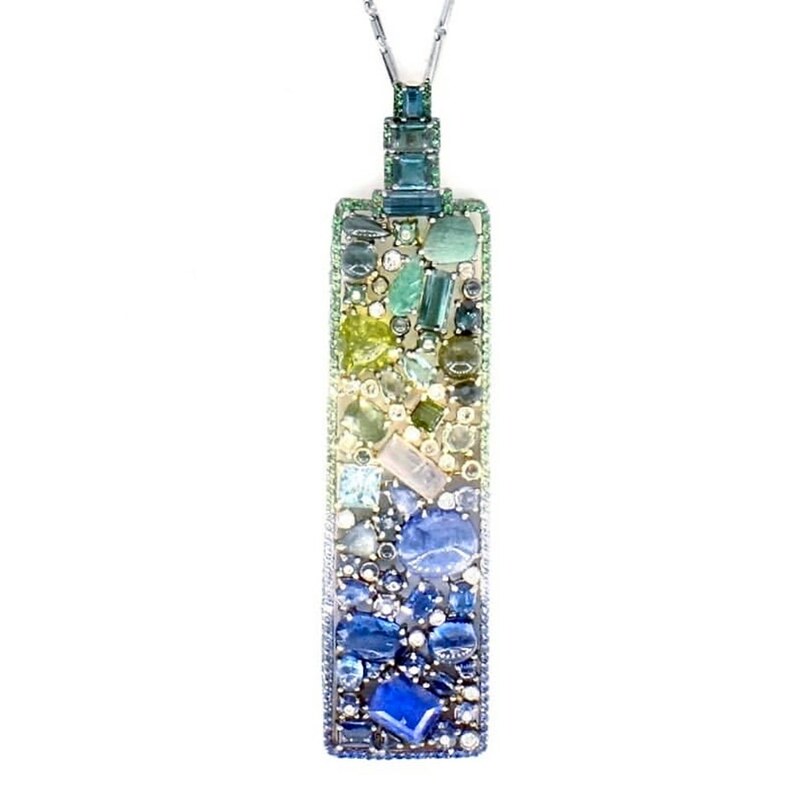 13 — I like to have a designer piece I’m completely obsessed with each season and this summer’s obsession is definitely this pendant from Sharon Khazzam. It reminds me of a gemstone collage, which you can luckily treasure forever because it is set in gold and not just gems laying on a work bench. Would love to see this piece in person one day! I love the ear cuffs on you. The mini circle ear cuff is so elegant and unique! 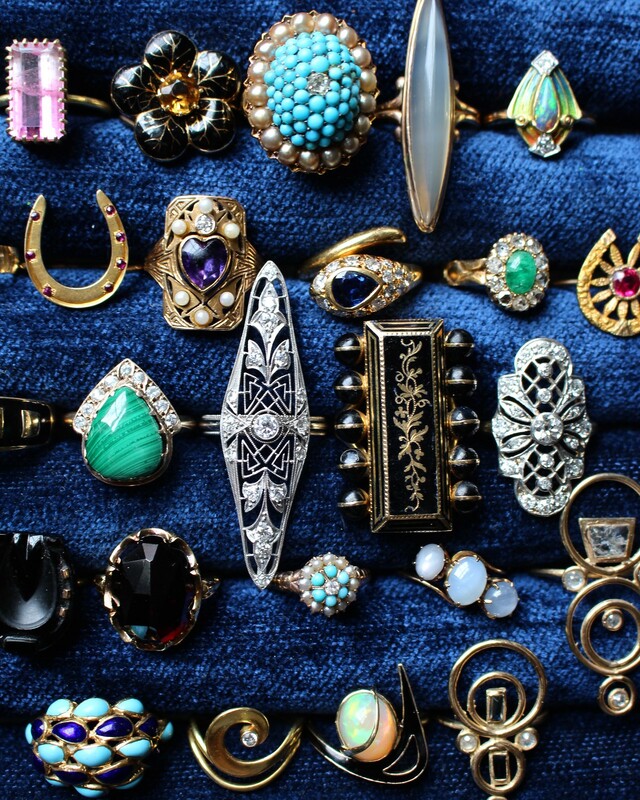 I will have to add some ear cuffs to my jewelry collection! Thanks for the inspiration! The way you blended those earrings together is perfect! Jewelry can compliment an outfit really nice, as it did here. I love it! I love those ear cuffs! I have been wanting a few but I haven’t found any I like. Those are so cute!! These pieces stand out so much. 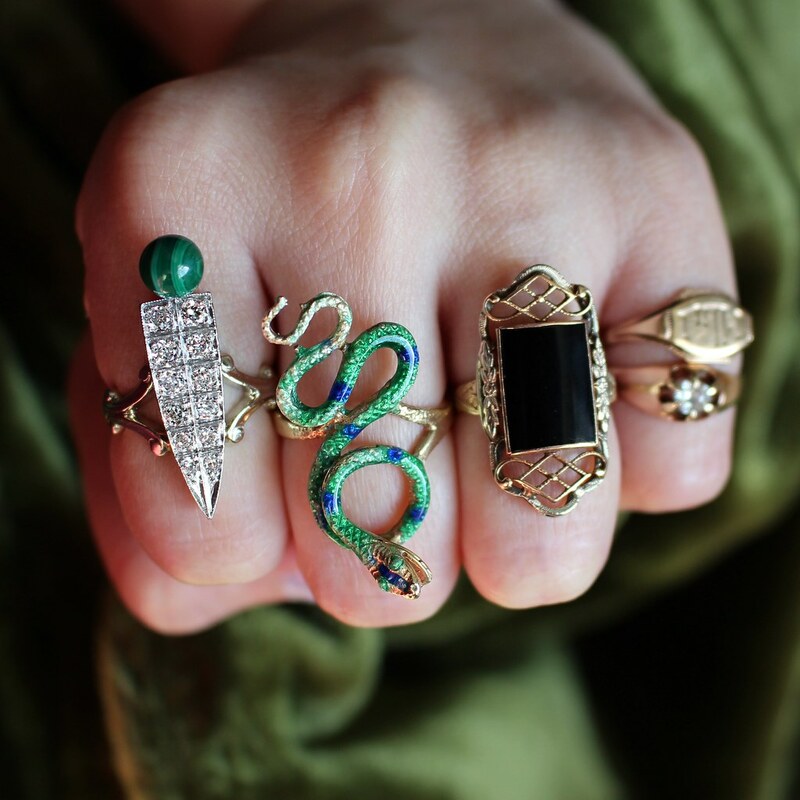 If you’re wearing a minimalist outfit, any of these rings would make the whole outfit pop! I’m loving all of these pieces!! Especially the gold ear cuff! The ear cuffs are such a cute understated accessory and makes any look a little more chic, especially if you have your hair up. I love how you mixed and matched them with earrings.